This is Allie writing this blog in reflection of the great time I had with Paul in Petrified Forest, who is still in Arizona. I have been home for about one week now since returning from this long-awaited cross-country roadtrip. 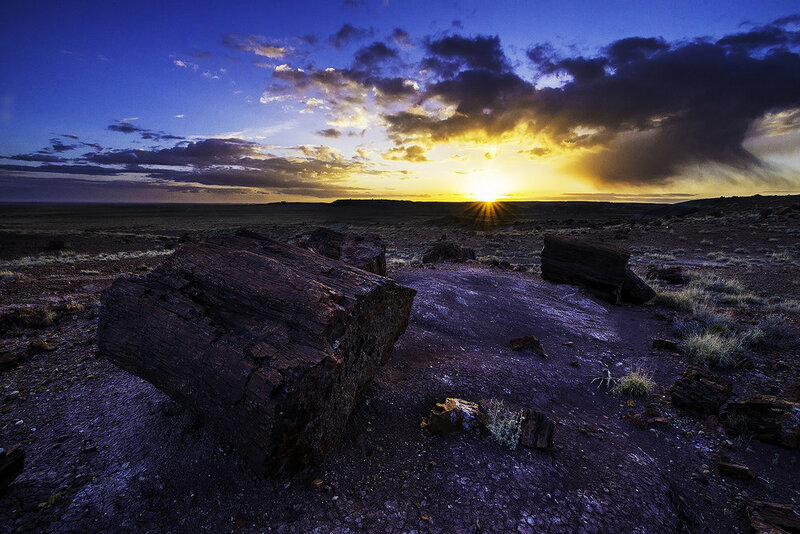 Paul was awarded an Artist-in-Residence position for the entire month of April in Petrified Forest National Park, which is a non-paid position given to artists in hopes to create publicity and visitation to the parks who participate. This awesome opportunity allowed us (really him, but I tag along) to have lodging inside the park, and special access to areas not opened to the public. He was driving anyway, so I thought I would keep him company on the way down (and to take advantage of this once-in-a-lifetime gig!). From Massachusetts to Petrified, we drove 2,300 miles, and took 4 days to reach it, driving 10 hours per day only. And if you’re wondering, yes, we slept in our vehicle. I familiarized myself with the rich trucking culture of America on our way, passed through the ‘Bible Belt’ with their giant (and I mean enormous) crosses erected on hillsides, and saw lots and lots of cows (and a stop at Cahokia and the Arch). I feel like we passed through so much of the country in so short a time it seems a blur, but the wacky road signs and billboards are what I remember most. Once we reached Indiana (and Missouri, Texas, etc) there seemed to be a billboard every 200 feet, all advertising the same thing. Literally. I remember seeing some 20 signs in a row for the Warm Glow candle store in Indiana, or the Catholic Superstore in Texas (their tagline is: “The place for all your Catholic needs!”), or Knife City (which we stopped at) in Arizona. After reaching Petrified, we took the day to settle in and scout out where we would be spending the next few days (or month for Paul). We visited every main site in the park, which is stretched out over 22 miles of road. We had a pretty good idea of how we would allocate our time, according to the sunrise/sunset and moonrise/sets. The two shoots that stick out to me the most were the shoots at the Rt. 66 marker (the car) and in Crystal Forest for sunset. Petrified only recently added the Rt. 66 exhibit – a 1932 Studebaker marking historic Rt. 66 as it used to run directly through the park. Here, you can actually walk past this marker and along the old route, and if you look hard enough, you will find all sorts of remnants and things left behind by travelers on the road from when it used to be a highway. We found old Coke and soda bottles, soda cans, rusted car parts and more. But all of this is hard to capture in an artful way. With our VIP access, though, we were able to stay after dark. Using Sun Surveyor, we could see that the center of the Milky Way would pass right over the car around 3 am the next morning. So, we napped and came back at 2, and made use of the few minutes of clear weather and made some unique photos. I think this might possibly be my favorite shot I made from the trip. The other shoot was a great, dense sunset at Crystal Forest. We perched ourselves at some split logs facing West and stayed until dark, shooting away. We must have looked like such nerds with all of our gear - Paul with his two camera bodies, two tripods (one with a rail and smartphone mounted with a Trigger Trap), and me with my more modest Nikon set up. I got a few great sunset shots, and a bio-worthy portrait of Paul, and Paul captured what I think is one of our best timelapse videos. We also visited the Painted Desert overlooks, Blue Mesa, Agate House, Keystone Arch and walked out to Martha's Butte to see some of the more impressive, but lesser visited petroglyphs in the park. Which I am still blown away by. After those few days, we had planned to do an intense backpacking hike to Reflection Canyon at Lake Powell, which would take at least 3 days to complete. We decided on this months ago. We brought our packs and camp gear specifically for the occasion; we even had GPS waypoints downloaded and ready to go. The water level would be just right and we were mentally preparing. Only when we actually plugged the route into the GPS and and Google maps did we realize exactly how much longer it would actually take - in addition to the two days worth of hiking, we would have had to drive into Utah, on the complete other side of the lake, (about 4 hours) and drive on a dirt road for another two hours just to reach the trailhead. All in all, the hike would have set us back by 4 or even 5 days - simply not worth it given the time I had. So, we said "screw it" and thought we'd scout out our 2018 tour to Arizona instead. So we were off to Page, Arizona. We spent the next 3 days basically being tourists. We visited Horseshoe Bend three separate times: once for sunset (soooo many people), for a few hours in the middle of the night, and during the middle of the day. We also visited Lower Antelope Canyon (which is supposed to be less crowded, but, still lots of people); I made some of my favorite shots here. And one of the more interesting parts of this sidetrip was the adventure that it was to be able to visit the Coyote Buttes in Paria Canyon. If you didn't know, this area, which is located in both Arizona and Utah, is incredibly protected and is a real hassle to get to or to see. 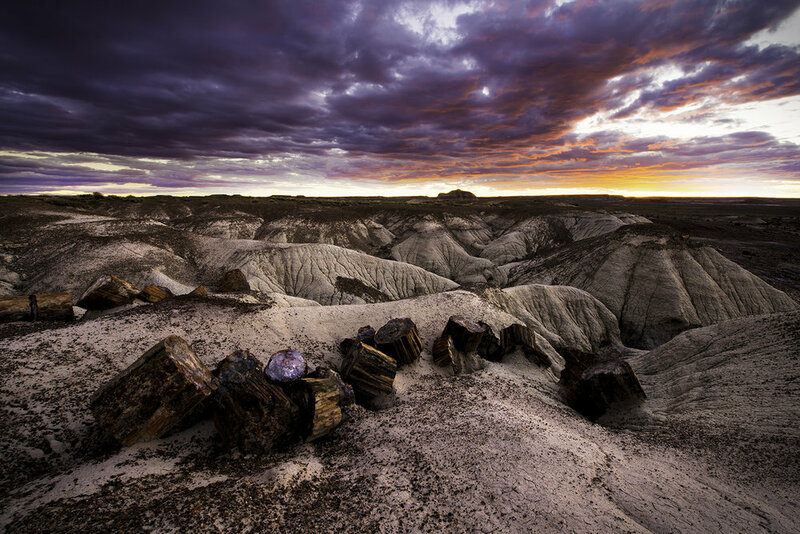 The Coyote Buttes are separated into North and South. North is where the famous "Wave" is located, and if you do get to see it - congratulations, it's truly once in a lifetime. South is much less famous, and much more difficult to get to. Let me explain. To see either North or South, you have two options: 1) Apply for a permit for each online four months in advance. Only 10 permits are awarded for each day of the month for online applicants via a raffle system for both areas. When you apply, you can only pick 3 dates. Just to give you an idea, there were over 800 applications for the month of April. Option 2) Be a walk-in. Another 10 permits are awarded on a raffle basis to walk-ins for the next day. That means, you physically need to be present at the Bureau of Land Management in Kanab, Utah (which is so inconveniently not close) the day before you plan to hike either North or South. We tried both options. On the day we visited the office, (a Wednesday) there were 51 groups of people crammed into a room trying to win a permit for The Wave. Once the raffle was over, the placed cleared out. There were maybe two other people waiting for Coyote Buttes South. So, we got our permit for South. We spent the night preparing and driving to the trailhead, which took way more time than we thought and we were glad we had a 4x4. There was no way you could get there without one - which is another thing you are warned about. It can take days to be rescued! And in this part of the Vermillion Cliffs, there are no trails at all. Nothing. You have to be really careful. We had to do some sleuthing with the map that was given to us compared with a topo map to figure out where we were at times. We didn't do this until later in the day, and we definitely went "the hard way." We didn't see a single person the entire time we out there. This trip also led us to adopt a mascot! Kanab (pronounced Kay-Nub) the Collared Lizard will now be featured on our travels and workshops! And with that, my time in AZ was just about over. I had one day left, and we spent it driving to Sedona. We made some shots of Cathedral Rock at sunset, and I fell and ripped my brand new camera bag. At least I didn't fall in the river though. The long and drawn-out journey home was really long and drawn-out, and I'm happy I'm home with a lot of new images and a tour for next year to plan!